Обладнання: тематичні малюнки, підручник (Welcome 2, автор Вірджинія Еванс, Елізабет Грей, видавництво ExpressPublishing, рік видання 1999), тематичні flashcards, відео, фізкультхвилинка. Т: Good afternoon, dear children! My name is …..and today, I will be your teacher. Today we will continue our work with farm and wild animals. We will read, play, learn new words and so on. T: Are you ready to start our lesson? Імітація за вчителем. Вивчення скоромовки. If one goose has one tooth. How many teeth have thirteen geese? Т: Let’s repeat one more time. Т: Thank you, good job! Перегляд відео, слухання та повторення. 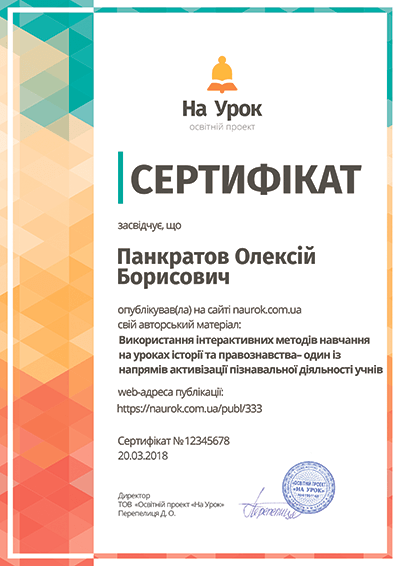 Закінчення уроку. Пояснення домашнього завдання. Підведення підсумків, оцінювання. T: Let’s revise words which you learnt before. T: (Співвідношення слів і картинок) You have to fill in the missing letters to have words according pictures. T: (name), go to the board. T: Look at the picture. What do you see? What animal is this? T: What animal is this? T: Is cow smaller or bigger than the snail? Ps: Cow is bigger than snails. T: Yes! It’s true! Well done! T: Compare a goat and a cow. Use word fast. Ps: A goat faster than a cow. T: Compare a chicken and goose. Use word happy. Ps: A goose happier than a chicken. T: Let’s have some rest! Stand up please. Repeat after me and do as I do! I can walk like a duck. I can jump lire a goat. I can swim like a goose. T: Now, open your pupil’s books at page 51 and look at the exercise 7. Listen the dialogue. T: OK. Now. Turn to each other and talk with your partner. T: Look at the board and find words. T: Open your work’s books at page 32 and names of animals. T: Let’s solve the crossword. T: Let’s we make a story. Let’s start. T: I’m happy to say we’ve done a lot of work. You worked hard. …,… and … worked very well., …., … and …. were very active at the lesson. …, and …made some mistakes. But don’t be sad. Thank you for your work. See you next time.